Dominic Gape was made Captain for the day. Fred Onyedinma was making his final appearance on loan from Millwall before returning to his parent club. It was also confirmed after the game that Randell Williams (Watford) and Bryn Morris (Shrewsbury) were returning to their parent clubs. "We don’t often have major video sessions to tear things apart but we had one after the Coventry game to look back at some clips from the last few games and it’s just little mistakes that have been costing us; nothing major. We’re not getting torn apart. There’s a really positive vibe – we know what points total we want and we’re excited to get there and build again. It took us four years to rebuild in League 2 and we want to grow as a League 1 club. I know I was a bit down after the Coventry game but that’s not me – I want to stay positive. The boys were in training on Thursday and Friday but get the weekend off, and then we want a reaction against Doncaster on Saturday. We’ve been through tough times in the past so this is relatively okay; we’re in a fantastic position at this stage of the season and we’d have taken this at the start of the year." "After the game against Coventry I was a bit down and I know it came across like that, but I’ve got nothing but positivity. I love my job – it’s a fantastic place to be, and this is an amazing club which we’ve all got to be super proud of. To be sat where we are, after some tough times, we deserve it because we’ve worked as a unit and everyone who’s got behind us and shouted for us has played their part. It’s my job to make sure we sustain this; it’s been a fantastic ride so thank you everyone. " Wanderers down to 14th - now only five points clear of the relegation places with 20 games left to play. 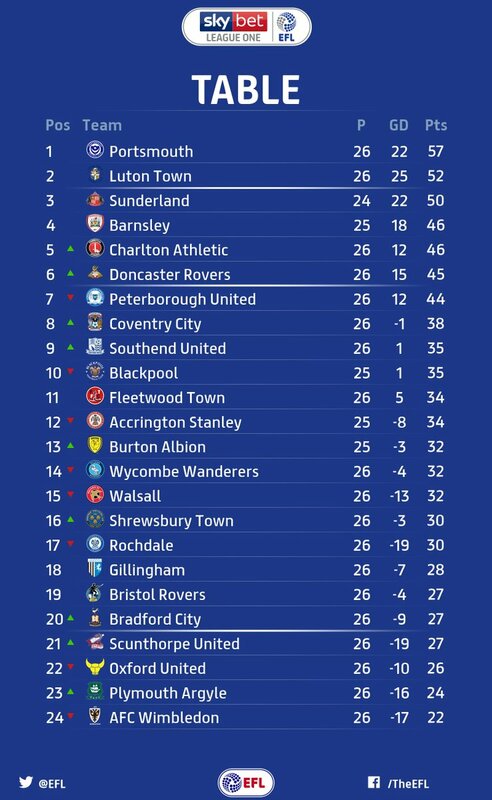 Oxford United have dropped back into the drop zone as Bradford City continue their good form to nudge up to 20th place. Wycombe's next game is at home to 6th placed Doncaster Rovers on Saturday 12th January.